Samsung’s three smart watches keep you in touch and more, from your wrist. Check out the Samsung Gear 2, Gear 3 Neo and Gear Fit, three very cool smart watches. All three keep you in touch without having to take out your phone. They're compatible with select Samsung phones and tablets, so you can see who's calling, read texts, and emails all from your wrist. Plus, you can customize notifications so you only get the information you want. Want to get fit? The Samsung Gear 2, Gear 2 Neo and Gear Fit all track your steps, calories burned, distance traveled and heart rate. The Gear Fit has a sleek design that's just right for fitness buffs. The Gear 2 and Gear 2 Neo are perfect when you want to go hands free to make calls or respond to text and emails using only voice commands. Call Samantha. If photos are your thing, use the camera I'm Gear 2 to take pictures right from your wrist. 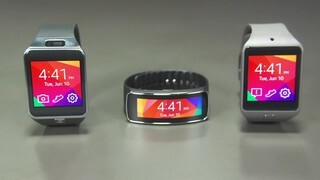 That's a quick look at the Samsung Gear 2, Gear 2 Neo and Gear Fit. Pick the one that's right for you by checking them out on bestbuy.com or coming into a Best Buy store near you to see them in person.